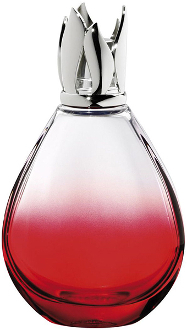 The Lampe Berger Venice Red lamp is made of heavy glass weighted at the bottom. The bright red color is graduated to clear at the top. Viewed from the side, the lamp is surprisingly thin. This high quality lamp comes in a nice gift box with funnel, burner and instructions. We recommend this lamp!